Shapeshifter is a novel system concept for all-access and cross-domain mobility on bodies with atmospheres. The proposed robotic platform is capable of mobility across domains including flying in the atmosphere, rolling on a smooth surface, navigating subsurface voids (ex. caves), floating on a lake surface and propelling under an ocean. Shapeshifter is a flying amphibious robot (FAR). It is comprised of smaller robotic units (each referred to as a cobot) which combine to shapeshift into different mobility modes. Each cobot is extremely simple with minimal design consisting of a few propellers as actuators. Shapeshifter can morph into a ball that rolls on the surface, a flight array that can fly & hover above-surface and move in subsurface voids, and a torpedo-like structure to swim under-liquid efficiently, among other mobility modes. In addition to all-access, cross-domain mobility, shapeshifter morphs into other functional systems to carry out a diverse set of tasks. Examples include transporting large and heavy objects, traversing long distances with minimal power consumption, creating communication networks to communicate to surface from deep hard-to-access areas. We propose to perform a novel investigation into the ability of a propulsively hopping robot to reach targets of high science value on the icy, rugged terrains of Ocean Worlds. The employment of a multi-hop architecture allows for the rapid traverse of great distances, enabling a single mission to reach multiple geologic units within a timespan conducive to system survival in a harsh radiation environment. We further propose that the use of a propulsive hopping technique obviates the need for terrain topographic and strength assumptions and allows for complete terrain agnosticism; a key strength of this concept. The objectives detailed in this proposal will be accomplished through the interdisciplinary collaboration of world leading robotics, propulsion, sample acquisition engineers, and planetary scientists from JPL, Purdue University, and Honeybee Robotics. 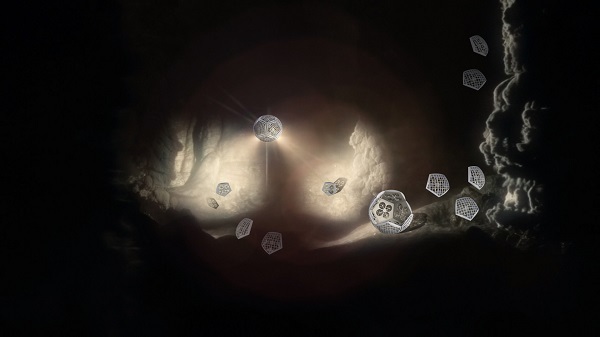 Asteroids contain a wealth of resources including water and precious metals that can be extracted. These resources could be applied to in-space manufacture of products that depend less on material launched from Earth’s surface. Within the next few decades, we will likely have the technological capability to retrieve asteroids and bring them to a processing facility near Earth, or to send a processing facility to the asteroid to extract the resources on site. However, a substantial investment is required to accomplish either task. 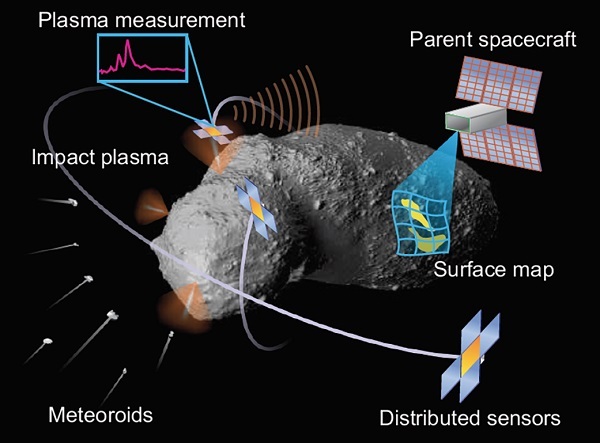 The Meteoroid Impact Detection for Exploration of Asteroids (MIDEA) concept leverages the natural space environment to provide a source of meteoroid impacts, resulting in erosion of the material on the asteroid surface. The material excavated by a meteoroid impact includes solid and molten ejecta, but some of this material is vaporized and ionized, forming a plasma that expands into the environment around the asteroid. This plasma expands outward into space and provides information on the composition of the asteroid surface. MIDEA enables a mission to a 100 to 1000 m near-Earth asteroid (NEA) using a parent spacecraft in the 10 to 50 kg range, carrying a constellation of ten or fewer free-flying sensors that are each approximately 100 g in mass. 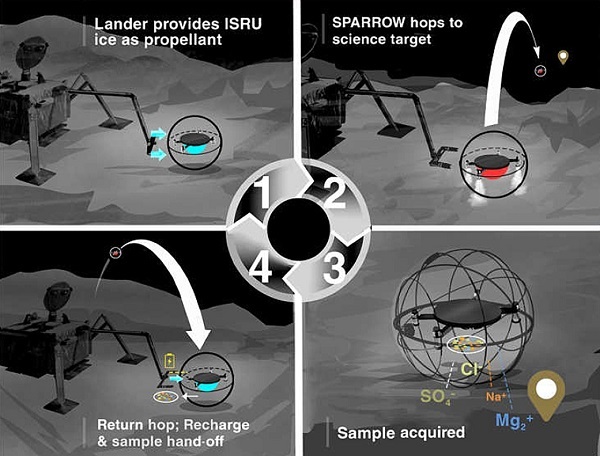 At this low mass scale, many such missions could be launched in parallel to different asteroids, performing a broad survey of potential targets prior to a dedicated in situ resource utilization (ISRU) mission.